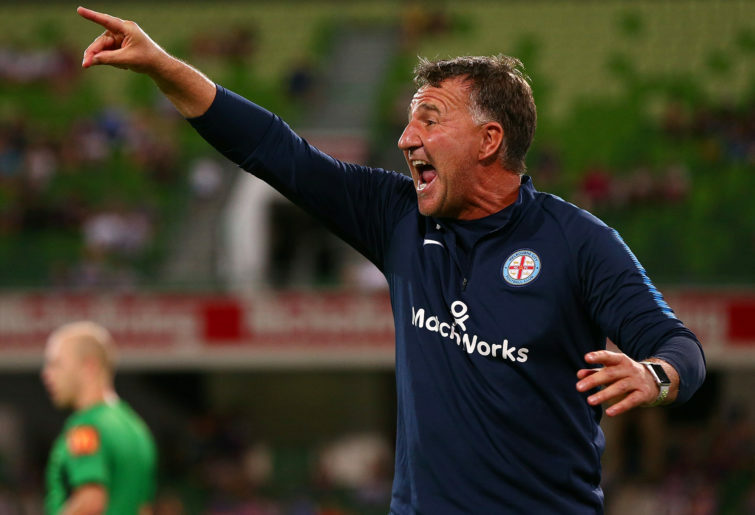 Yesterday’s 2-2 draw with Perth Glory was peak Melbourne City. Two-nil up after 35 minutes thanks to a double from a striker who became the club’s second-top scorer for the season in just his fourth game, City then proceeded to pass the ball around aimlessly until Glory scored twice in the final six minutes. And they probably would have lost the game had referee Alex King pointed to the spot when Diego Castro had a decent penalty shout in the first half. Mind you, City might have gone in front even earlier had two-goal striker Jamie Maclaren not side-footed home after the ball had already gone out of play. Some 7,746 fans were in attendance – if you believe the official figures – and despite taking just three points from the last 18 on offer, City should qualify for the finals with ease. Not why should they reach the playoffs, or why should Warren Joyce escape further scrutiny, but why do they exist? I should have prefaced that by stating that I’m not staunchly opposed to the City Football Group’s involvement in the A-League. Every league needs different types of teams, and in a competition where the clubs effectively started from scratch, the City Football Group’s ownership actually gives Melbourne City a point of difference. But that’s about the only thing it’s given them for the last few seasons. And the inertia around the club is costing them at the gate and causing plenty of critics to ponder what exactly is the point of having them in the league. The arrival of both Maclaren and on-loan Tottenham striker Shayon Harrison was a step in the right direction. But the elephant in the room remains the handling of City’s former record goal scorer Bruno Fornaroli. If the club has an especially compelling reason for the fan favourite being frozen out, they’ve never shared it with the public. And while there have been whispers that Joyce is the ideal manager to mould young talent, some of the club’s decision-making seems to suggest otherwise. City’s signings this season include 30-year-old Belgian defender Ritchie de Laet, a 29-year-old French midfielder in Florin Berenguer and the much-travelled 30-year-old Rostyn Griffiths. Meanwhile, highly-rated goalkeeper Mark Birighitti joined from Dutch club NAC Breda and hasn’t featured between the posts once. There’s nothing wrong with signing experienced players – every other club does it – but sometimes it’s hard to follow the logic. City say they want to play an exciting brand of football, then exile the most entertaining player in the club’s short history for the entire season before cutting him loose. They suggest they’re willing to give youth a chance, only for a 37-year-old shot-stopper to keep the goalkeeper they signed at the start of the season on the bench throughout the campaign. They present themselves as an alternative to Melbourne Victory, only for more Perth Glory fans to turn up in the away end than City have in their home end. Cartoonist David Squires skewered City in his inimitable fashion last week and no doubt put a few noses among the club’s hierarchy out of joint. But here’s thing: we’ve heard every excuse and justification and obfuscation under the sun. Melbourne City are supposed to stand for something, but at the moment no one can quite work out what that is. If the club’s new chief executive Brad Rowse has his finger on the pulse, he should be doing everything he can to ensure City has an international marquee star on the books by August. Otherwise City run the real risk of passing the ball around aimlessly once again next season, only this time there’ll be no one in the stands at AAMI Park to see it.